Our Director of Operations, Liza Lord, welcomes you to Crown Bay. Everything you need, right on site. 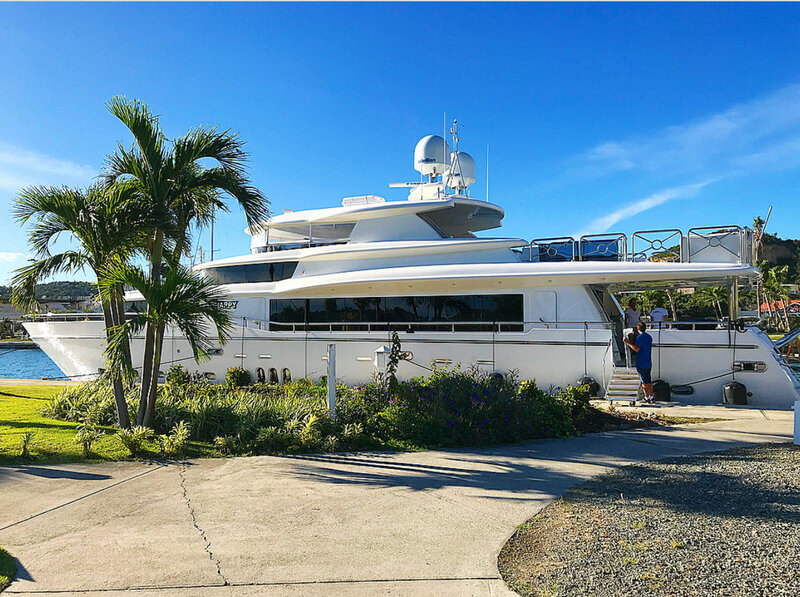 Crown Bay Marina has 16 berths (alongside and stern-to) suitable for Mega Yachts up to 200 feet in length, and is a preferred logistical destination for yachts cruising and chartering in the US Virgin Islands, British Virgin Islands, and Spanish Virgin Islands. On-site services include a pub / restaurant / bar, gourmet provisioning, ship’s chandlery, ice cream & coffee shop, laundry service, dive shop, cellular phone service (AT&T), mail / fax / email / secretarial services, car rental, fitness studio, hair salon & spa, massage therapy, skin aesthetician, dog & pet grooming service, and more. The marina is headed by Liza Lord — Director of Operations, in cooperation with her fully committed team of helpful, professional staff who are ready to deliver exceptional levels of customer service. Fuel dock open daily 8:00 a.m. to 5:00 p.m.
St. Thomas’ international airport and downtown Charlotte Amalie. WHERE IS CROWN BAY MARINA? Straddling the center of the Antilles chain of islands that arc northward from South America and separate the Caribbean Sea from the Atlantic Ocean, the U.S. Virgin Islands [USVI] are separated by a deep ocean trench that groups the islands of St. Thomas, Water Island, and St. John within the Greater Antilles, and St. Croix to their south, within the Lesser Antilles. 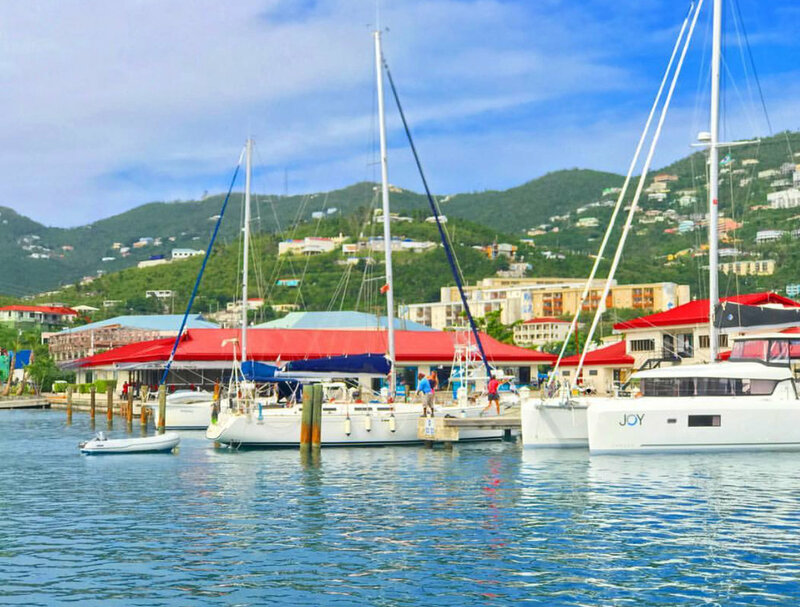 Situated on the south side of St. Thomas, immediately west of historic Charlotte Amalie Harbor and Hassel Island, Crown Bay Marina lies within the area known as Sub Base at latitude 18° 20' 24" North, longitude 64° 57' 24" West. Water Island, to the south, is noted for its secluded Honeymoon Bay beach, labeled Druif Bay on nautical charts. Yachts may approach via either West Gregorie Channel or East Gregorie Channel; both of which are well marked, as is the reef extending northward from Water Island. While in Gregorie Channel, mariners approach Crown Bay Marina by leaving the cruise ship dolphin piling to port. The signed entrance to the marina is immediately north of the northernmost cruise ship dock. The tall Puma sign rising from the fuel dock marks the entrance to the marina. Crown Bay Marina is conveniently located within ten minutes of the Cyril E. King Airport — an international FBO for private jets, which is also the most widely used commercial gateway to the U.S. Virgin Islands from the U.S. mainland, and a major hub for regional air carriers within the Caribbean region. Lying about 1,100 miles east-southeast of Miami, Florida, the U.S. Virgins remain on Atlantic Standard Time [AST] year-round. BRITISH VIRGIN ISLANDS AND SPANISH VIRGIN ISLANDS. Crown Bay Marina is a proud member of the Superyacht Services Guide. The Superyacht Services Guide is targeted to Yacht Captains and Crew and includes recommended industry-wide services. The guide also provides our targeted audience with an inside-look on cruising destinations and yachting bases worldwide. At Crown Bay Marina, the Superyacht Services Guides fly off our office shelves, and we are happy to be part of a publication that connects the most effective, efficient and reliable yachting services available. Crown Bay Marine offers the most convenient services right on site. Marina Office open daily 8:00 a.m. to 5:00 p.m.
RESERVATIONS, TO AMENITIES, TO YACHT SERVICES, WE’RE HERE TO HELP. Crown Bay Marina is a full-service Virgin Island marina for mega yachts and pleasure craft up to 200 feet in length. Our St. Thomas marina is situated ten minutes from the international airport with an FBO for private jets and adjacent to the DYT Yacht Transport staging area. All berths have metered water, power (Single and 3-phase power, 50, 100 amps, 110 / 220 / 208 and 480 volt capability), wireless internet, and 24-hour security. Maneuverability within the basin is enhanced with a controlled depth of 20' and unobstructed visibility. The Crown Bay Marina fuel dock is a well maintained 315 foot dock that delivers quality gasoline and Low-Sulfur Diesel at up to 150 gallons per minute, offering bulk discount prices. Crown Bay Marina offers the most competitive fuel prices of any Caribbean marina. Visit our contact page or send us an email via the front desk: info@crownbay.com and follow us on instagram and like us on facebook. Our Team welcomes you to Crown Bay. Crown Bay Marina has berths (alongside and stern-to) suitable for Mega Yachts up to 200 feet in length, and is a preferred logistical destination for yachts cruising and chartering in the US Virgin Islands, British Virgin Islands, and Spanish Virgin Islands. On-site services include a pub / restaurant / bar, ship’s chandlery, ice cream & coffee shop, laundry service, dive shop, cellular phone service (AT&T), mail / fax / email / secretarial services, car rental, fitness studio, hair salon & spa, massage /acupressure therapy, skin aesthetician, dog & pet grooming service, and more. Our team of helpful, professional staff are ready to deliver exceptional levels of customer service.